One of my interests is restoring vintage transistor radios. Of course, after 40 plus years of life, most electrolytic capacitors are suspect and the carbon-composition resistors have drifted high (and sometimes become very noisy). No surprises there. But the reliability and failure modes of vintage transistors is interesting, and is the subject of this article. 1.1.2 Replace with an equivalent? 1.1.3 Cut the screen lead? 1.4 How about the glass types? 2.1.1 Why do they fail? The earliest practical transistors were made from germanium, and devices using this material were commonly used well into the 1970s. It's true that silicon transistors are better in most regards, but used appropriately, germanium transistors can give excellent results, and generally, they are remarkably reliable - especially when you consider how young the semiconductor industry was - but there are some noteable exceptions. 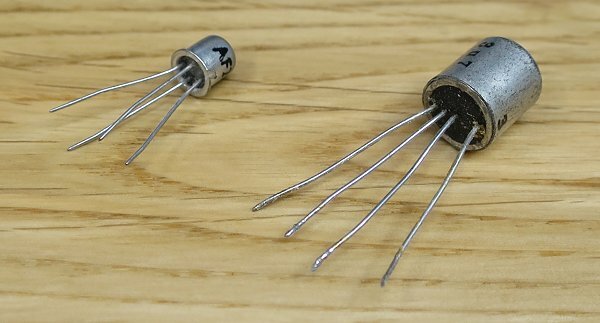 The alloy-diffused AF114, AF115, AF116 and AF117 transistors were introduced in the early 1960s. There is an AF118, but this is not found in transistor radios - it's a high voltage transistor intended for use in video circuits, but it is occasionally found elsewhere (for example, the Leak Stereo 30 hi-fi amplifier). The AF117 is commonly used in AM radio stages, and the AF114-6 types are found in FM radios. They are very similar in practice - indeed, according to the data presented in the classic reference Towers International Transistor Selector, there is no difference. I suspect that they are all the same piece of germanium, and are labelled according to their measured HF performance. Unfortunately, the tin plating that is applied to the base metal of the encapsulation exhibits the rather surprising phenomenon of growing whiskers that ultimately make contact with electrodes inside the can. These whiskers are many times thinner than a human hair, but they are able to pass a current that will interfere with the operation of the transistor. The basic effect has been known about within the electronics industry for many decades, and has been studied by many authorities, including NASA. Indeed, they have specifically investigated the AF11x transistors. The "cure" to tin whisker formation is to add an amount of lead to the tin, forming an alloy which doesn't form whiskers. For many years, this meant that the tin whisker problem was a historical problem, but unfortunately, the recent removal of lead from the electronics industry has resulted in a recurrence of the problem. History will teach us nothing! A failed AF11x transistor is usually easy to spot; if you see one, it's probably faulty! Sometimes, sharply tapping the case might temporarily dislodge the offending whiskers and cause the set to spring into life. Often though, this doesn't work. Taking DC voltage measurements might be enough to prove the existance of the problem, or simply measuring the continuity between the screen lead and the other leads (with the set powered down, of course!) might be a useful approach. To be absolutely sure, remove the transistor and measure the resisance between screen and the other leads. Any leakage at all - no matter how slight it might seem - could be enough to stop the set working. In short, no! Unfortunately, the exact mechanism for tin whisker growth is still unknown, but it does seem that the presence or otherwise of an electric field has no effect. So, just because a transistor has been sitting around unused for 50 years, it's no guarantee of its condition. Forget about it. And don't pay silly money for NOS examples of these transistors and expect them to work! Option 2 is better. The best equivalent transistors are the AF12x series that are the same piece of germanium, but mounted in a TO72 case. This looks like the ubiquitous TO18 package - as used by the BC108 and similar - but with a forth lead for the screen. This package seems to be immune to the tin whisker problem - presumably the case wasn't plated with pure tin. But, there are problems with this approach. For a start, these transistors are hard to find today - NOS is the only sensible option - and vendors are very aware of their usefulness when setting prices! Additionally, they look "wrong". Many collectors wanting to perform sympathetic restorations will pay attention to aesthetic matters - especially if it's a set that displays most of its "works" when you open it up to change the batteries. Sometimes, people will cut open a failed AF11x device, discard the contents, and glue the AF12x replacment in place - this works well because the TO72 package is considerably smaller than the TO7, and from a casual glance at the top of the PCB, this "fix" is invisible. The final problem with the AF12x replacements is that their leads are much, much shorter than the TO7 AF11x. This means that to fit them to some sets - Hacker, for example - the leads might need to be extended. As AF12x transistors are hard to find, it's worth considering silicon devices in this role. Perhaps surprisingly, many general-purpose PNP transistors will work with no modifications. Basic "jellybean" transistors like the BC558 or 2N3906 might do the job. But with this approach, it is impossible to draw up any specific guidelines, and all I can say is that you have to be prepared to experiment and test carefully. You might need to carry out some realignment, and you might need to adjust a resistor or two to get the bias correct - especially if it's a self-oscillating mixer stage. One for the more experienced engineers! So, from an electrical and long-term reliability point of view, a compatible replacement might well be the best option - especially if you are providing a warranty for the repair - but it's not without compromises. No! It's a bodge of the highest order. OK, if the immediate problem is a short from the case to a single electrode, then yes, this will probably get the set going, and it will probably work well enough, despite the fact the case is no longer earthed. But the key word above was "immediate". You can be 100% sure that sooner or later, the thriving community of tin whiskers will find their way to another electrode, and then you'll have a short-circuit between the first electrode and the next one. And a dead radio. Additionally, should you decide to "treat" the transistor - see below - then that procedure will be complicated by fact you'll have a much shorter screen lead. Don't do it! A faulty AF11x transistor can be fixed. It's important to realise that this can only be regarded as a short-term fix, but it's easy to do, and for the sets that were designed with easy servicing in mind - such as those made by Hacker - then it's no real hardship to repeat the treatment every few years. Having said that, I've been treating transistors this way for a long time, and I have yet to see a recurrence. These whiskers seem to grow slowly, and they do have quite a long way to go inside the package. The idea of fixing these transistors is well-known, and everyone has their own preferred method. The technique adopted will impact on the long-term success of the repair, so I use a method that I believe will give the best reliability - however, others will have their own thoughts. A quick search of the various vintage radio forums will return lots of information - so make your own mind up. The basic idea is to pass a high current through the tin whiskers so that they are vapourised, but obviously this has to be done in a way that doesn't damage the germanium junction inside. You have to use a lot of energy to ensure that as much as possible of the whiskers are removed. Using a high voltage will ensure that you "catch" any whiskers that are close to making contact with an electrode. And of course, during this process, you don't want to put yourself at risk of recieving an electric shock. Remove the transistor from the radio. Measure the resistance between screen and the other electrodes - you might find that at least one of them will exhibit a low resistance (10Ω or less), or you might find that any resistance is pretty high - a few kΩ or more. In some cases, you might not find any leakage at all. Even if this is the case, you've taken the effort to remove the transistor, so carry on with the procedure - treating them can fix a fault, even if there appears to be no leakage to speak of. Connect together the collector, base and emitter leads. Use a dab of solder to be absolutely sure they are firmly connected. If you forget to join them, then there is a risk of damage to the junction. 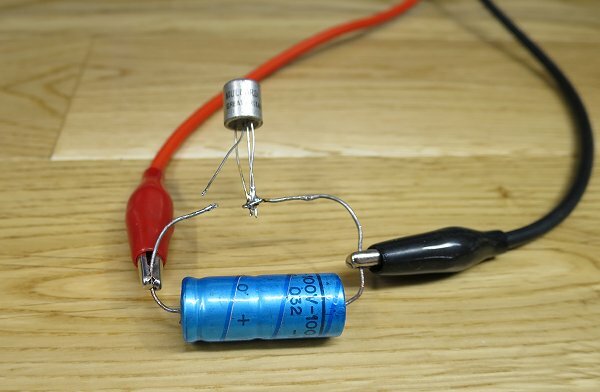 Find a decent electrolytic capacitor - this will be charged up by a bench power supply, and will ensure the maximum energy is delivered directly into the transistor. I'd recommend using at least 100µF for this. The voltage rating obviously depends on what you have available. Solder one end of the capacitor to the 3 twisted electrodes. Bend the leads so that the screen lead is just a short distance away from the other end of the capacitor. Wind up the voltage of the power supply. Take great care to ensure you don't touch both ends of the capacitor at the same time - espeically if you are using higher voltages. Bring the end of the capacitor and the screen lead together, and watch and listen for a small spark as the energy is discharged into the transistor. If you are especially lucky, you might even see the bottom end of the transistor light up (the base plate is glass). Wind down the DC power supply to zero volts. You've probably sorted it at this stage, but I do an extra step (I think I invented this, for what that's worth!). Solder the screen lead to the capacitor, and wind up the voltage again. At this stage, we're not expecting any current to be flowing, as we've already zapped the whiskers. But, these can be tricky little things, so we'll hunt out any that might be hiding just out of reach... Very carefully, sharply hit the body of the transistor from several different directions. I hold the transistor just a couple of millimetres above a metal bench vice, and hit it from above with a large screwdriver - this gives the transistor a double-impact from two sides. Rotate and do it again. After 30 or so seconds of this, you can be confident that there is nothing waiting to "land" after just a few weeks of operation. Sometimes, you do see the PSU output dip slightly as the capacitor quickly recharges after an impact, which is reassuring confirmation of something actually happening during this part of the process. Finally, check for leakage between the screen and other electrodes. Re-fit the transistor to the radio (I never bother testing it first), taking care to neatly straighten out the leads and re-forming them to fit back into the PCB. Re-fit any sleeving that was used, and be extra careful about putting it back correctly (many manufacturers omitted the silk-screen from their PCBs). Once all the transistors have been done. the radio should burst back into life - although of course you might have to search for other age-related faults like faulty electrolytic capacitors. If needed, basic DC voltage measurements will confirm that the transistors are acting as transistors. Note the example on the right, which comes with an aluminium case mounted over the TO1 package to facilitate heat sink mounting. Transistors in this package usually had a suffix of "-01" or "K". The package is called X04. Being commonly used in the output stage, these are prone to overload and thermal issues. They can fail completely, which is normally pretty easy to spot, but they can also partially fail with the symptom of much-reduced current gain, which gives rise to a high distortion and reduced output voltage swing on one half of the waveform. Easy enough to spot with an oscilloscope. There is another failure mode which could apply to several types of transistor, but I'll mention it here because unfortunately, the TO1 transistors are statistically more likely to suffer from it. Basically, when manufacturers started adding sockets to allow the radio set to be powered from an external DC power source - be it a car battery or a mains adaptor - this meant that the output pair became at risk of damage from the application of incorrect polarity. Even a brief connection of the wrong polarity could be enough to harm the output transistors. Normally, the damage stopped there, but if left incorrectly connected for long enough, electrolytic capacitors might start to protest - often with extremely messy results! In most cases, the remaining semiconductors were sufficiently protected by power supply decoupling arrangements, but not always. Another failure mode is greatly increased noise. I've seen this perhaps half a dozen times in the driver stage in the audio amplifier used by Hacker. Incidentally, it's more correct to refer to this transistor as the "VAS" (voltage amplifier stage), but most people who learnt about basic amplifier theory back in those days refer to it as the driver. Either way, I'm talking about T4 (AC128) on the A205 amplifier assembly, as used in the Hacker Sovereign II (RP25), the Herald (RP35) and the VHF Herald (RP37). The symptom is sharp, impulsive noise, and on a 'scope it shows up as positive-going spikes. It looks like the transistor is intermittently breaking down. Of the failure modes considered so far, replacement is the only cure. 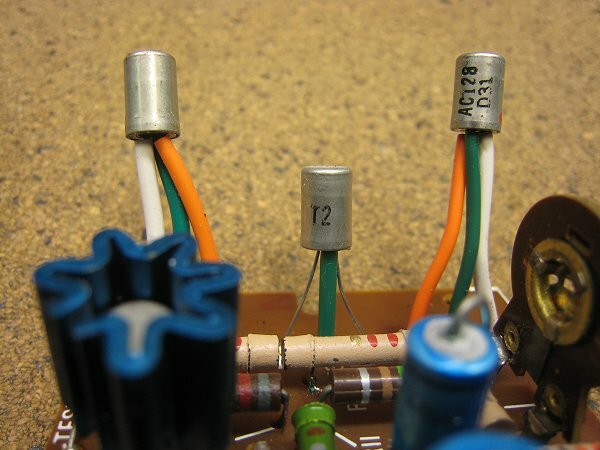 These transistors are relatively easy to find, but some of them can be expensive - luckily, the circuits are generally non-critical, and some substitutions can be performed - refer to Towers or some other equivalent guide. Oh, and be aware that a modern version of the AC128 (and others) exists and is readily available as NOS - they were available at the larger suppliers like CPC until relatively recently. However, it's in a different case that has a smaller diameter than the original TO1 types, so doesn't fit very well into the copper heat sink clips that were popular at the time. The final thing to say about these transistors is that they can suffer from the tin whisker problem. This is contrary to the "accepted wisdom" found on radio forums, and people are often surprised when I report it, but yes, it happens. Unlike the AF11x types, it's by no means certain that they will develop tin whiskers, but don't rule it out. Of course, there is no screen lead, so it doesn't necessarily cause quite the same problems that the AF11x types do - unless the transistor is mounted on the chassis for heat sinking purposes. The whiskers can be zapped in exactly the same way, but it's a bit less convenient because there is no screen wire. A croc-clip can be used to get a good contact to the case. Several Hacker sets use a transistor that has no markings other than "T2". Questions about these very occasionally crop up on the vintage radio forums, but no-one seems to know anything about them. I even created an entry about them on Radiomuseum.org in the hope that someone might recognise them. Other than the usual red dot to denote the collector lead (not visible in the picture), there are no other markings on the transistor. I have seen a mention of "T3", which has a blue spot - with TO1 transistors, a red spot implies PNP, and blue means NPN. From memory, that was found in a machine made by Philips. So, what's the story? I have a theory, but so far it really is just a theory. As I have only ever seen these in the VBE-muliplier position, where there is guaranteed to only ever be a volt or two across it, I wonder if these are transistors that failed to meet their breakdown voltage specifications, but were otherwise reasonably OK. Then sold to selected customers with strict instructions about how to use them? Unfortunately, it's very hard to search for information about these as "T2" and "T3" are frequently used as designations on circuit diagrams and parts lists! But, should you ever encounter a faulty one, just about any PNP germanium transistor should be a suitable replacement. Obviously, if it is attached to a heat sink with a spring clip, then a device with the TO1 package is required - the AC128 is the obvious option, but as there will be hardly any current passing, something like an AC125 might be better if you have one - save the AC128 for output stage failures. How about the glass types? The first germanium transistors that I encountered as a kid were the glass-encapsulated OCxx types - OC44, OC45, OC71, OC81D, OC81, etc. The latter types listed were often further encapulated in an aluminium can for improved heat dissipation - the OC81D was often used as a driver (ahead of an inter-stage phase-splitting transformer), and a pair of OC81 types formed the push-pull output stage. Sometimes you find them with a printed plastic sleeve, in various colours. Irrespective of whether or not the can or sleeve is included, the encapsulation is called SO-2. Incidentally, the OC71 was introduced in 1954. It was by no means the first commercially released transistor, but it was extremely popular and remained in production for many years. Similarly, the OC44/45 were launched in 1956. I still find it incredible to think that this was 60 years ago! Obviously, they are physically fragile. Also, should the paint flake off, the transistor will behave to some extent as a phototransistor - plenty of unsuspecting engineers wasted hours searching for the source of mysterious humming before realising that their bench lights were the cause! Incidentally, there was an official phototransistor available - the OCP71 - which was filled with a clear silicon grease to allow maximum light transfer. The regular transistors were treated to a more opaque filling (as seen above) - apparently, if you scrape off the paint from a transistor to find a clear filling, it was probably a rejected phototransistor that was tested to see if it could be sold as a regular OC-seried transistor (reference). Happily, silicon tranistors have proved to be extremely reliable, provided they are correctly used. Germanium transistors are very sensitive to temperature, and they were comparatively expensive, so designers tended to use them very conservatively, with plenty of heat sinking where appropriate. Silicon transistors are able to withstand much higher junction temperatures, so designers naturally took liberties with the thermal design. Coincidentally, by the time manufacturers were using silicon devices for output duties, the UK market had become a lot more competitive, with no shortage of cheaper imports taking sales from the home-grown products, so the temptation to save every penny possible must have been overwhelming. At some point in the late 1960s, Mullard introduced a new range of transistors in a package that was called "Lockfit". As you can see from the picture, the style is very distinctive. The short, stubby legs are preformed to facilitate PCB assembly - either manually or by automatic means. These transistors were literally everywhere in the 1970s, and I rescued a fair few of them when I took things apart when I was a kid. For audio use, the BC147, BC148 and the BC149 were very popular - as far as I can tell, the silicon inside each of these is the same as was fitted to the ubiquitous BC107/8/9 transistors (which were in the metal TO18 can). In RF and IF stages, the BF194 and BF195 were popular. As with the AF11x range, it's hard to see an obvious difference between them when you simply examine the data in Towers, but Mullard recommended that the BF194 was used in IF stages, and the BF195 is intended for input and mixer stages. Additionally, there was the BF196 and BF197, which are recommended for use in TV applications, but they usually work OK in radio circuits (be aware that they have more bandwidth and a lower HFE). Having introduced them, what is the problem? Unusually for a transistor, they have a partial failure mode. Yes, complete failures do happen, and perhaps slightly more often than with other types - especially those that lead a quiet life on a signals panel - but the partial failure mode is a really strange one to explain. Compounding the issue is this simple fact: the partial failure might not be at all obvious - whether the fault is noticed depends on where it occurs in the circuit. For that reason, I suggest that the actual failure rate is higher than the anecdotal evidence suggests. The symptom is greatly increased noise. It's a very distinctive type of noise - not the usual hiss (white noise) that we are used to hearing from audio amplifiers in general. Rather, it's an impulsive, low-frequency type of noise - almost like a rumble. It's almost certainly a type of noise called "shot noise". Forum members frequently report excessive noise with these sets - present at all settings of the volume control, which obviously narrows it down to the amplifier. The subjective description is as given above - a low frequency rumble. In many cases, T1 is the culprit - I've changed dozens of these (I use the BC108 as a replacement; the very first versions of this PCB shipped with these, so it's a "sympathetic" repair). As you can see, T1 is followed by two other voltage amplifier transistors: T2 (another BC148) and T4 (AC128), so it makes sense that any excess noise generated by T1 is going to be effectively amplified. If T2 was to suffer the same fate, then it won't cause the output to be anything like as noisy, as it's only followed by T4. In fact, if you were lucky, you might be able to swap T1 and T2, on the off-chance that T2 was a quiet example, and the noise from T1 now won't be noticed. No, I don't recommend that course of action - change both T1 and T2 for BC108s and be done with it! While I'm talking about this amplifier, it's worth noting that almost exactly the same type of noise can be produced by RV3. So before reaching for the soldering iron, it's worth giving RV3 a quick bit of switch-cleaning spray and exercising it. Once done, set it so that there is 8.9V at the positive end of C10 with an 18V supply (and set the current at the test link to 3mA while you're at it). Oh, and if neither RV3 or new transistors cure the noise, start investigating carbon composition resistors. R1 and R3 have played up in the past. Away from this audio circuit, the BC148 might be used in any number of applications that won't necessarily show any symptoms when the transistors are playing up. For example, the RP25B used a BC148 in a simple voltage regulator circuit for the RF stages (as did the Sovereign III "family" - the RP72, RP74, RP75, RP76 - and many other later sets). In this instance, rather than being followed by a lot of gain, the voltage regulator is followed by generous decoupling. Likewise, in the Super-Sovereign, a pair of BC148s are used to drive the tuning/battery meter. Not a critical circuit, and again, you're unlikely to notice a problem unless things were seriously faulty. Regarding the BF194/5 types, when these partially fail, the symptom is a loss of sensitivity in the receiver. Whether it's actually the same problem (rising noise giving the impression of less sensitivity), or some other effect, I haven't tried to determine. But, when faced with low sensitivity, it's normally a Lockfit transistor at fault. I really wish I had a bit of spare time to build up some sort of test jig that can characterise these transistors outside of a radio, as I'd like to be able to sort through my spares. It's worth saying that like with the audio amplifier example, it's the "earlier" transistors - earlier in terms of where they appear in the signal path - that give the most trouble, which does tend to reinforce the idea that excess noise might be the problem. It's a good question. It's obviously something related to the packaging, and I wonder if the package is somehow allowing moisture in? There could be a mechanical problem, as the short and very stout legs - that go into the PCB with a distinct clicking action - could be stressing the package in some way. Compare the legs of a Lockfit to a TO18 case, or a plastic TO92 - it's certainly conceivable that this could be part of the problem. And those legs will conduct the heat of soldering towards the junction much more effectively than the skinny legs of a TO92. Anecdotally, I sense that they might have become more reliable as time went on (just thinking about the sets I repair, and noticing that it's more of a problem for the earlier models), so perhaps Mullard improved their processes over the years? Perhaps it depended on certain batches, or which facility manufactured them? To be honest, I doubt we'll ever find the answer. But being aware of the problem - which could affect NOS as well, depending on the exact cause - is the important point to take away. You have to be sure your replacement component is unaffected. Changing transistors in radio sets is not always easy - especially the ones located in the FM front end. So, it's nice to be a bit more deterministic about this. One really useful piece of information is that when they have partially failed, they seem to become fairly temperature sensitive. It's not 100% guaranteed, but armed with a can of freezer spray and a hairdrier (or heat from a soldering iron), we can approach replacement with some confidence. Where possible, it's best to avoid using second-hand or NOS Lockfit replacements. As exact data about the failure mechanism is not yet available - and nor is it always possible to be confident about your spares stock - I generally prefer to replace them with other types. As mentioned earlier, the BC147/8/9 seem to contain the same silicon as found in the BC107/8/9, and these TO18 devices have proved to be extremely reliable over the years. I would have no hesitation in using these as replacements - especially as these transistors were very much around when Lockfits were commonly used. If you are less concerned about maintaining an authentic appearance, then the BC547/8/9 are excellent transistors that are also very reliable when correctly used. These are in the TO92 package. I believe they were introduced at some point in the mid-late 1970s, and are simply TO92 versions of the BC107/8/9 types. When substituting, it's useful to be aware of the differences between these transistors. Basically, the BC1x8 is the general purpose transistor, the BC1x7 is rated to a higher voltage, and the BC1x9 is a low noise device. I strongly suspect that they all come from the same production line, and were tested and characterised before being labelled; that's a relatively common practice in the semiconductor industry. So, if the original transistor was a BC149, it's best to use a BC109 or BC549 as a replacement - although in practice, the difference in noise might be negligible. Likewise, if the original was a BC147, then check the circuit carefully to see what voltage the transistor might be subjected to, and replace with a BC107 or BC547 if in doubt. Remember, the BC1x8 was always the cheapest of the three, so designers generally only specified one of the others if the application required it. It's also worth being aware of the gain groupings. During testing, the transistors are characterised according to their HFE, and labelled accordingly with a suffix, which could be "A" for low gain (125 to 260), "B" for medium gain (240 to 500), or "C" for high gain (450-900). If there was no suffix, then it could be anything in the range of 125 to 500 (or 900). The exact numbers vary with device, and where you get your data from - I've quoted figures from a Mullard data book published in 1979. As a principle, design engineers will try to ensure that their circuits aren't unduly affected by exact values of HFE as it's a decidedly shifty parameter, but if they specified a particular gain grouping, it does make sense to stick to it if possible. Of course, this is where knowledge and experience of transistor circuits comes into play - the more you understand the circuit, the less dogmatic you can be about making substitutions. These transistors are NPN, but obviously PNP versions are available. BC157/8/9 are the Lockfit types, and these can be replaced by BC177/8/9 in a TO18 can, or BC557/8/9 in the TO92 style. The first problem with the BF194/5 is the unusual pin-out, which puts the emitter in the middle. So any substitution is made easier by finding a device that follows that. The BF494/5 are good bets, but these are obsolete, so you're looking for NOS. Later Hacker sets used the BF394/5. Sadly, these are no more easy to find today. The BF184/5 - in a TO18 can - is also a workable alternative, but these have a 4th lead for screening, which isn't always easy to attach to anything - it's normally OK to leave it floating. Again, these are long obsolete, so NOS if you can find them. These suggestions contain pretty much the same silicon as the original Lockfit types. But given how hard these are to find - even harder than finding NOS Lockfits - you might have to investigate alternative types. I've seen the BF199 suggested as an alternative, but it's also obsolete. The Farnell website suggests that 2N5089 is a suitable alternative, and they are pretty cheap, but at the time of writing, they are US stock only, so you'll have to stump up £15.95 delivery charge. Cricklewood sell them for a somewhat higher price, but factor in the delivery and depending on the quantity you want, they'll probably work out better. Should you decide to try these, note that the pin-out is not the same as the originals. And also bear in mind that I haven't tried them myself. Another suggestion is the BF255, but these seem to be even harder to find that the others! As always, a good knowledge of transistor circuits will help, but to an extent, it's always going to be a bit of a gamble - things do get more complex as the frequency goes up! If you have experience and a decent amount of test gear, then at least you're in a position to verify that the repaired unit works to specification. My experiences with radios has taught me to hoard everything! Even a totally ruined radio can yield some usable transistors for a future repair. 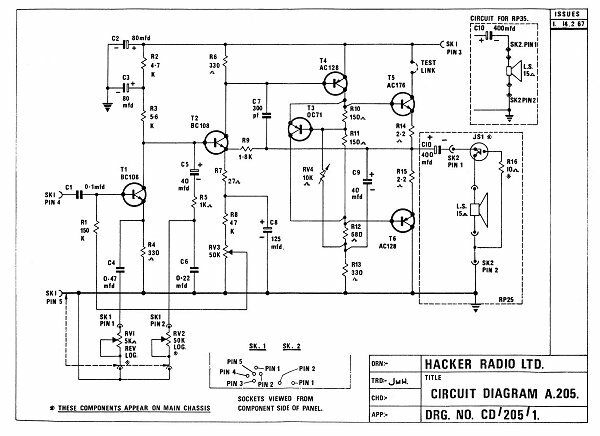 Later on, Mullard released some quite "beefy" Lockfit transistors - the BC465/464 pair, for example, were used as audio output transistors on many radios, including models from Hacker and Roberts. These fail pretty regularly, but that's down to overheating - certainly there is no doubt about their failure when it happens. The BC464/5 are rated to 1.5A each, and are good for about 20 volts. The BC462/3 offered the same current, but at around 30 volts. That sort of current handling is extremely unusual in a plastic package that has no sensible provision for mounting on a heat sink. Spring clips were available - as seen here in the Sovereign IV RP77MB, but they were not always used. For example, the Hacker SP80 - an expensive stereo set - used a set of these per channel with no heat sinking beyond what the copper on the PCB offered. Substitutes are hard to recommend, because along with the high current handling, they have a reasonably high HFE - about 100 up to 280. Medium power transistors tend to be in the 50-100 range. However, I have successfully used BC337/BC327 pair - these are good for 800mA, but it's normally enough in practice. I'm amazed at how reliable the transistor has proven to be - most are working long after the expected lifespan of the products they were fitted in, and of those few that do fail, most seem to be related to the seemingly mundane matter of the encapsulation rather than the complicated semiconductor material! 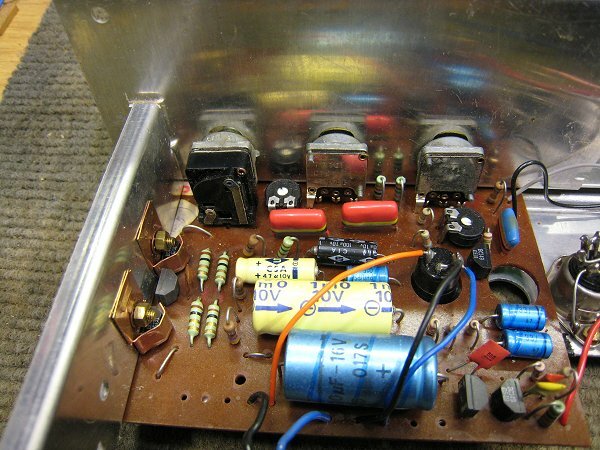 Knowing that certain types of transistors are prone to failure is essential knowledge when restoring old radios, and other electronics from the same era, of course. I hope that the information here is of interest to vintage electronics collectors - constructive feedback is very welcome, as always.